It’s finally hot here in New Hampshire, although who knows how long that will last! I decided to make a light and fresh dinner even though I was craving some cheesy pasta. 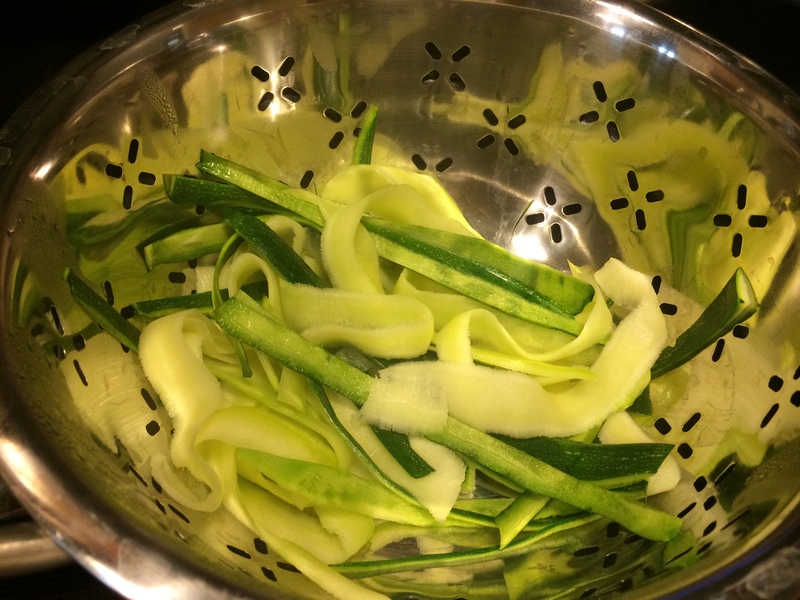 So I whipped out my vegetable peeler and made some “noodles” out of zucchini. It’s a simple and healthy way to indulge a comfort food craving and light and refreshing on a hot summer day. 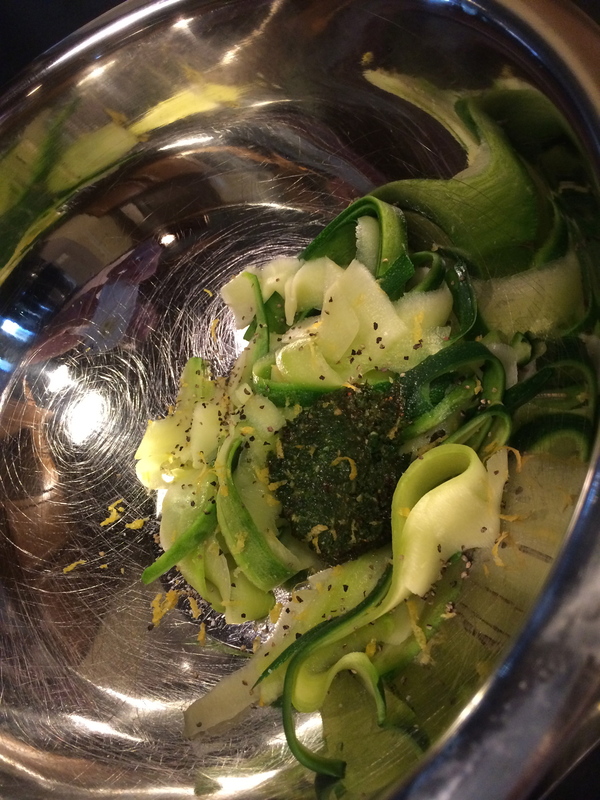 First I peeled a zucchini into ribbons and steamed it lightly. (You don’t have to steam it, it’s great raw as well, but I think the texture is closer to pasta when it’s semi-steamed. I steamed the asparagus next and then mixed it in a bowl with pesto, lemon zest and juice, pesto, salt, pepper and freshly grated Parmesan. Steam the zucchini ribbons in a steamer basket (or like I did in a stainless steel colander placed in a saucepan with a couple of inches of water.) When they are steamed but still firm remove and drain, then place in a large bowl. Put the asparagus on to steam until softer but crisp. Drain and add to the bowl along with the pesto, the lemon zest and juice, salt, pepper and Parmesan. Gently toss with tongs or two forks and serve topped with cherry tomato slices. 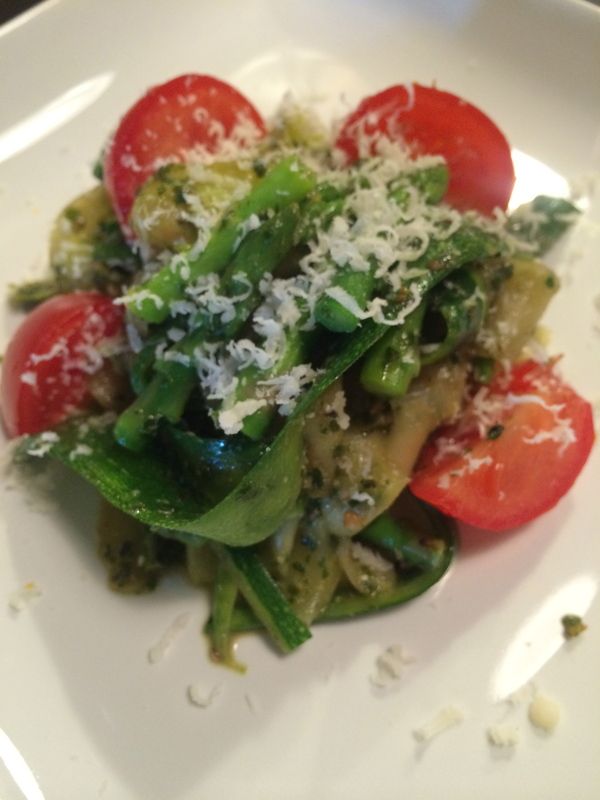 This is a super light and healthy meal with a fresh citrusy veggie taste and the sharp bite of Parmesan. 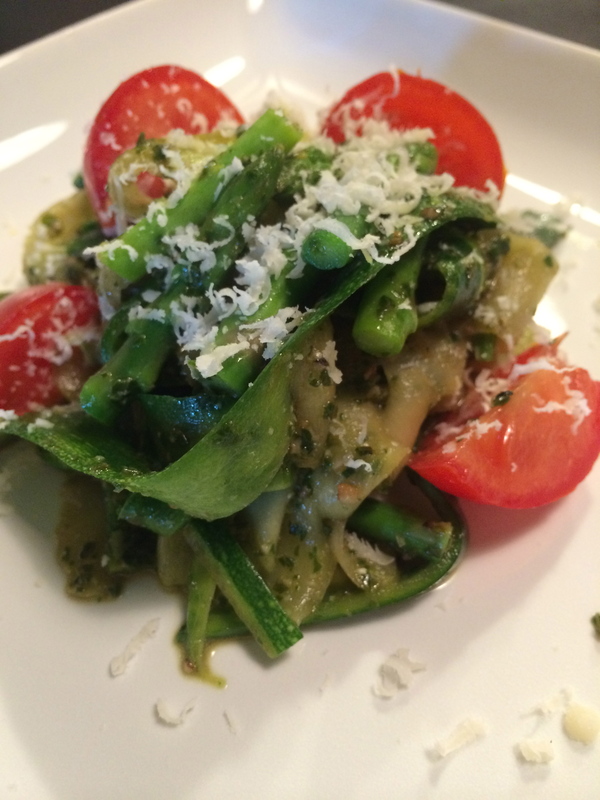 You can serve it as a main vegetarian dish or a side dish to a summer barbecue.